Hemcore (www.hemcore.co.uk), the UK's only commercial hemp processing company, is to expand its operations with the construction of a new £3.6 million industrial hemp processing facility near Halesworth in Suffolk. When running at full capacity the facility will employ 35 people and enable Hemcore to process 50,000 tonnes of hemp straw a year. The hemp plant has two constituent parts: the fibre and the woody core or 'shiv'. Demand for both of these products is growing rapidly. Hemp fibre is increasingly used in the automotive sector, primarily in the manufacture of door panels and other parts. Demand for hemp products is also growing in construction, where the shiv is used as an energy efficient building material and the fibre is used as a natural insulation material. Emerging markets for hemp products include plastics reinforcement, nutrition, clothing and horticulture. The new facility is being installed in an existing building at the Halesworth Business Centre. The site was selected to ensure it was close to the majority of existing hemp growers, many of whom are in the East of England. This is also an area where the growing base is expected to expand rapidly as the demand for hemp products continues to increase. Installation will begin in January 2008 with commissioning due to start in May. It is expected to be fully operational in the summer of 2008, with production increasing over a four year period until full capacity is reached. Total funding required for the project was £4.1 million and Hemcore has raised over £2,500,000 of new equity. Low Carbon Accelerator, an AIM-listed environmental fund, is the largest single investor, having invested £1.08 million. Harlow Agricultural Merchants, the founder of Hemcore, has also invested, together with members of The Great Eastern Investment Forum (GEIF), a Cambridge-based business angel network and a range of smaller investors and growers. The project is supported under the England Rural Development Programme (ERDP) by the Department for Environment, Food & Rural Affairs (Defra) and the European Agricultural Guidance and Guarantee Fund, in the form of a grant of £514,000 towards the cost of specialist processing equipment. The grant funding will be managed by the East of England Development Agency (EEDA) while debt finance is being provided by Barclays Asset Finance. David Sillett, Rural Development Manager at EEDA, said: "EEDA is pleased to manage the delivery of the ERDP funding for this project, which contributes to the adoption of more sustainable construction methods, while creating additional employment and benefiting farmers, who can profitably grow an alternative crop." Currently 4,500 tonnes of hemp are processed at Hemcore's existing facility in Maldon. This will be closed down when the new factory becomes operational. Hemp products are environmentally friendly because 99% of the plant is actually used. The facility is also proving to be a flexible, fast-growing and profitable crop for an increasing number of farmers. It grows easily with the workload spread evenly through the year. Sowing is generally in April/May with harvesting in August/September. The plant is tolerant of both drought and heavy rain, does not required pesticide or fungicide and also improves soil condition. Commenting on the new facility, Mike Duckett, Managing Director of Hemcore, said: "Our new facility is great news for the environment and the region's farmers, more and more of whom are already reaping the benefits of growing hemp. "It's also beneficial for the many industries which are increasingly turning to hemp as a sustainable and highly effective natural material. "Finally it's good news for the UK. Industrial hemp is a completely natural, sustainable and low carbon material. When you think that fifty per cent of the country's carbon emissions come from the construction and use of buildings, you can appreciate the huge contribution hemp-based products can make in helping us reduce our overall carbon emissions. 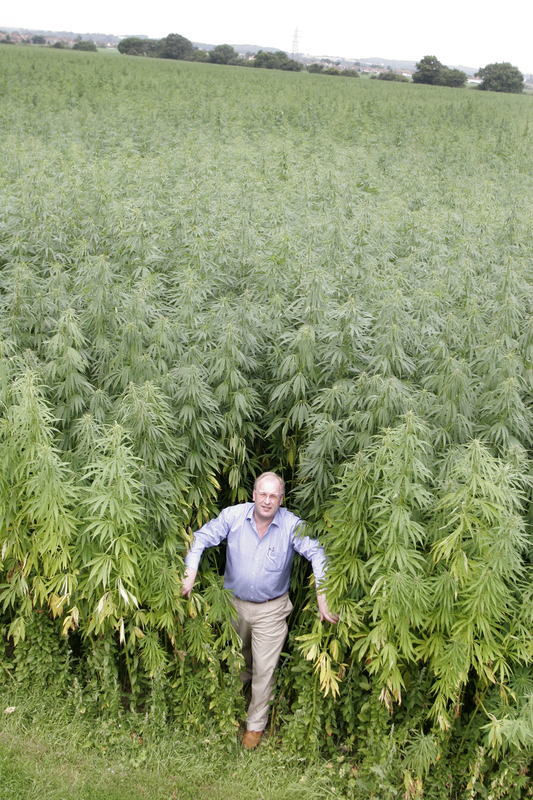 We're delighted to be bringing this first major hemp processing facility to the UK." Essex farmers Dan and Humphrey Squier commented: "As farmers we're all delighted at the change in fortunes for cereals but, for many of us, the lack of good break crops is a problem. This major development by Hemcore presents a real opportunity to grow an excellent break crop for dynamic and developing markets." Defra Environment Minister Phil Woolas added: "Hemp can help reduce the environmental impact of products such as cars and buildings and so help tackle climate change. "This new investment in Suffolk will provide many benefits - for local jobs, the economy, and for those farmers who will have the opportunity to help meet increased demand for this crop. It also gives a clear signal that the UK is serious about developing the bio-economy in the UK because of the many benefits it can provide - including reducing greenhouse gases, cutting waste and pollution and helping biodiversity." Notes to editors: The England Rural Development Programme (EDRP) was jointly funded by Defra and EU funds to provide new opportunities to protect and improve the countryside, develop sustainable enterprises and to help rural communities to thrive. A total of £1.6 billion was made available under the ERDP during the seven years (2000-2006) of the programme. The successor, Rural Development Programme for England, (RDPE) will deliver £3.9 billion of Government and EU funds over the period 2007-2013 to safeguard and enhance the rural environment, improve the competitiveness of the agricultural sector, foster competitive and sustainable rural businesses and thriving rural communities. For more information on EEDA, please contact Adrian Ient on 01223 484699.